Ginger Fan - This is more of a question. I'm worried about my cousin. She has Type 2 diabetes. I'm very heavily into alternative treatments, not to replace conventional treatment but as a way of supplementing them and enhancing the results. I've seen almost miraculous results from alternative treatments including ginger for my dog's cancer. The vet said he should have died 4 times during his treatment and that he survived the cancer are all miracles. But my cousin is now taking ginger for her diabetes. She says it's nearly eliminated her neuropathy and has lowered her blood sugar and pressure. I did some research on the net and have found that it supposedly help type 1 diabetes but can make type 2, which she has worse. Does anyone here have any knowledge or experience with this? How does it help type 2 and what are the risks? At the beginning, I have to congratulate you for understanding what the exact aim of this natural treatment is. Eventually, most patients still think that natural treatment can replace the conventional one, which is not true. It is true that drugs are made of plants, but during their production the formula is reinforced, which is making them quite more effective than the plants. Therefore, please advise your cousin that she has to continue taking the medications, no matter if she is taking ginger or something else. Moreover, your cousin could experience lowering in blood sugar while she would be on ginger treatment; which would require a reduction in the daily dose of her glucose lowering medication. So, she has to consult her doctor from time to time for any dose adjustment. Second, I want to remind you that the recommended daily dose of ginger, for the treatment of type 2 diabetes is 250 mg, acquired 4 times a day. So, tell this to your cousin and make sure that she is not exceeding this dose in purpose to archive better results. How does ginger improve the glucose metabolism? How does it reduce the blood pressure? How does ginger reduce and eliminate the symptoms of diabetic neuropathy? general vasodilatation, which means that it makes the blood vessels go wider. When the blood vessels are wider, more blood is distributed to the organs, which of course improves their function. As you probably know, insulin is produced from the pancreas, and when more blood is aimed versus the pancreas more insulin is produced. Besides this, the general vasodilatation causes relegation of the arterial blood pressure. In addition, ginger has anti-inflammatory effect, which means that the gingerdiones (substances in the ginger) are suppressing the inflammation. In general, inflammatory processes in diabetic patients are affecting mainly the beta-cells in the pancreas and the peripheral nerves. When the gingerdiones are suppressing the inflammation, the beta cells and the nerves are protected from dying and damage. So, when the beta cells are protected from inflammation, they are able to produce more insulin. On the other hand, if the peripheral nerves are not damaged by inflammatory process, they can execute their normal function. 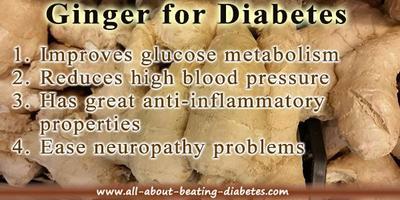 It is true that ginger is more effective in patients with diabetes type 1, because of the diseases’ origin. However, this drug is also working in some patients with diabetes type 2, if the exact cause of their illness is progressive beta-cell damage. As the condition of your cousin is improved, I think she might have a diabetes caused by a progressive beta-cell damage. Moreover, there is one more thing I want to tell you. It is proven that ginger is more effective when it is combined with garlic, so tell this to your cousin. Because of the fact that your cousin is female, tell her not use ginger during pregnancy or while she is breast-feeding her baby, because it is not scientifically concluded the safety of ginger. Next, force her to talk with her doctor, if she is taking anti-coagulants or anti-platelet drugs, like Aspirin, Warfarin or others. I’m telling you this, because such combination increases the risk for bleeding, which may end in very bad way.